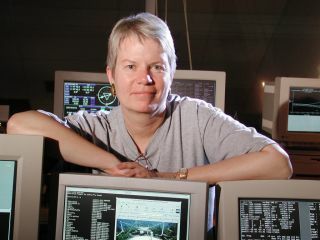 Astronomer Jill Tarter, the inspiration for heroine Ellie Arroway in the novel and movie "Contact," is retiring after spending 35 years scanning the heavens for signals from intelligent aliens. Tarter is stepping down as the director of the Center for SETI (Search for Extraterrestrial Intelligence) Research at the SETI Institute in Mountain View, Calif., the organization's officials announced today (May 22). But rather than go lie on a beach somewhere,Tarter will continue to devote herself to the search for E.T. She's shifting into a full-time fundraising role for the SETI Institute, which had to shut down a set of alien-hunting radio telescopes for more than seven months last year due to budget shortfalls. Tarter, 68, got involved in the SETI search in the 1970s, joining a small group of NASA scientists who were developing new equipment and strategies to make systematic SETI radio observations. She signed on after reading "Project Cyclops," a seminal 1971 NASA report that described how to use Earth-based radio telescopes to hunt for signs of intelligent alien life up to 1,000 light-years away. "I hadn't ever been thinking about SETI, or intelligent life elsewhere," Tarter said. "But when I read that document, I was absolutely astonished by the fact that I lived in the first generation of humans that could actually try to do an experiment to answer this really old question." "The fact that I was alive with the right skill set, at just the right time to tackle this important question, was what hooked me," she added. "That's why I signed up to SETI when I was getting out of graduate school. And I've stayed hooked. I just think it's an amazing privilege to try and take on this challenge, and answer this old, fundamental question." Though Congress killed NASA's SETI efforts in 1993, Tarter kept up the search. She'd already been with the SETI Institute for nearly a decade at that point, helping to create the nonprofit organization in 1984. In the decades since, she has continued to shape and steer the Institute's sky-scanning efforts, long serving as director of its Center for SETI Research. Today, the SETI Institute employs more than 150 people, and its scientists are engaged in a range of astrobiology work beyond just looking for radio signals. Tarter said she's proud of the progress the organization has made since the early days, when a handful of pioneering scientists ran the whole show. The Institute "is far bigger than I ever envisioned it would be when we incorporated it in 1984 with very modest goals to save NASA money," Tarter said. "We have a very vibrant institution of astrobiology, and also education and public outreach, that most people don't know about." A look at the SETI Institute's Allen Telescope Array at Hat Creek Observatory about 290 miles northeast of San Francisco, Calif.
SETI had to shut the ATA down in April 2011, however, after budget problems forced the Institute's former partner, the University of California, Berkeley, to withdraw from the project. The telescopes came back online in December, after SETI secured enough money from private citizens and the United States Air Force, which is interested in using the array to track satellites and space debris, SETI officials said. In April 2012, California-based nonprofit SRI International came onboard, taking over management duty of the Hat Creek Radio Observatory (which includes the ATA). The experience convinced Tarter that she could make a bigger difference in the SETI search by focusing entirely on fundraising — which she's been doing part-time for many years as the Institute's Bernard M. Oliver Chair for SETI — than by continuing to direct the Center for SETI Research. "It was just eye-opening," she said. "We've got to get stable funding into the house to do SETI research. We have a new partner — we got that deal done, so we can operate the array. But now we've got to provide funding for people to actually use it and do clever things, and do research, and look in new ways." Tarter added that the Institute needs to raise $2 million every year to keep SETI research going. That's the starting point, but she hopes to shoot for $20 million annually at some point, to expand the search and support a variety of SETI activity around the world. Tarter said she doesn't particularly enjoy fundraising, but views it as so important to the future of SETI research that she feels compelled to take it on. She's excited about the Institute's current work, and its future. The ATA, for example, has been listening for signals from the many alien planet candidates discovered by NASA's Kepler space telescope. To date, Kepler has flagged more than 2,300 such potential planets. While only a small fraction have been confirmed so far, the Kepler team estimates that at least 80 percent of them will end up being the real deal. The current flood of alien planet discoveries is investing the SETI search with more purpose and enthusiasm, Tarter said. Astronomers can now point their radio scopes at many star systems that are known to harbor planets, some of which may even be Earth-like worlds. "The Kepler worlds are really legitimizing SETI," Tarter said. "All of us that are even peripherally involved with that are looking and saying, 'You know, Earth 2.0 — that's just right around the corner. We can almost taste it.'" Tarter's colleagues will celebrate the researcher and her career on June 23, during a gala event at the SETICon II conference in Santa Clara, Calif. SETICon II, which runs from June 22-24, will bring together scientists, artists and entertainers to explore humanity's place in the universe and the future of the search for life beyond Earth.